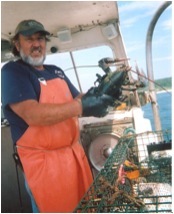 MA lobsterman, Dave Casoni, harvesting the day's catch. Photo credit: MA DMF. American lobster (Homarus americanus) is a bottom-dwelling crustacean widely distributed over the continental shelf of North America. In the inshore waters of the US, it is most abundant from Maine through New Jersey, with abundance declining from north to south. Offshore, it occurs from Maine through North Carolina. Two stock units have been identified based on regional differences in life history parameters. They are the Gulf of Maine/Georges Bank (GOM/GBK) stock and the Southern New England (SNE) stock. Reproduction and growth are linked to the molting cycle. Lobsters periodically shed their shell to allow their body size to increase and mating to occur. Males deposit sperm in recently molted females who store it internally until extrusion, which can be delayed for up to two years. When extruded, the eggs are fertilized and attached to the underside of the female, where they are carried for 9 to 11 months before hatching. Females carrying eggs are often called “berried” females. Eggs hatch from mid-May to mid-June, and the new lobster larvae begin their 5 stage transition. Larvae are planktonic for the first 4 stages, swimming at or near the water surface. At the fifth larval stage, juveniles sink to the ocean floor where they remain for the rest of their lifetime. Lobsters reach market size in about four to nine years, depending on water temperature and other biological factors. The American lobster fishery is one of the most valuable fisheries along the Atlantic coast. In 2017, 136.7 million pounds of lobster were landed coastwide, representing a $566.4 million ex-vessel value. The vast majority of these landings came from the Gulf of Maine/Georges Bank (GOM/GBK), where the stock is at record high abundance. In contrast, there has been an overall decrease in the percentage of landings from the Southern New England stock, which is depleted and experiencing recruitment failure. 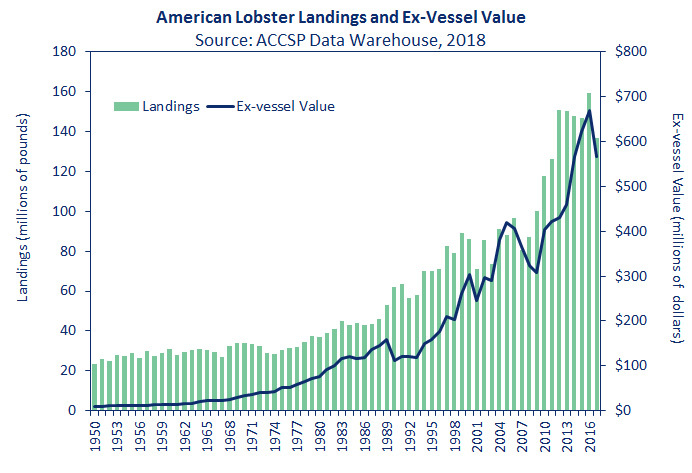 Total U.S. landings in the fishery have steadily increased in the past 35 years. Between 1950 and 1975, landings were fairly stable around 30 million pounds; however, from 1976 – 2008 the average coastwide landings tripled, reaching 92 million pounds in 2006. Since then, landings have continued to increase, reaching 117 million pounds in 2010 and peaking at 158 million pounds in 2016. The 2015 American Lobster Benchmark Stock Assessment and Peer Review Report indicates the American lobster resource presents a mixed picture of stock status, with record high stock abundance and recruitment in the Gulf of Maine (GOM) and Georges Bank (GBK), and record low abundance and recruitment in Southern New England (SNE). The GOM/GBK stock is not overfished and not experiencing overfishing. GOM and GBK were previously assessed as separate stock units and are now combined into one stock unit due to evidence of seasonal migratory patterns and connectivity between the two areas. Conversely, the SNE stock is severely depleted with poor prospects of recovery, necessitating protection. GOM/GBK stock abundance has increased since 1979 and at an accelerated pace since 2007. Current stock abundance is at an all-time high and recruitment has remained high between 2008 and 2013. Importantly, since 2012, there have been consistent declines in the young-of-year surveys in the GOM/GBK stock. This could foreshadow declines in recruitment and landings. SNE stock abundance increased from the early 1980s, peaked during the late 1990s, then declined steeply through the early 2000s to a record low in 2013. Both the assessment and peer review support the finding that the SNE stock is severely depleted, with record low abundance and recruitment failure. This poor stock condition can be attributed to several factors including changing environmental conditions, such as warming waters and increased predation, and continued fishing mortality. Declines in population abundance are most pronounced in the inshore portion of the stock where environmental conditions have remained unfavorable to lobsters since the late 1990s. Despite attrition among the fleet and fewer traps fished for lobster, population have continued to decline. Declines in catch and fishery-independent survey indices in the offshore portion are evident as well; however they are not as severe. It is believed the offshore area of SNE depends on nearshore larval settlement and offshore migration as the source of recruits (e.g., young of the year lobsters). Therefore, unless fishing effort is curtailed, the offshore component will be in jeopardy in the future when the poor year classes fail to materialize offshore. For SNE, the Panel recommends close monitoring of stock status along with implementing measures to protect the remaining lobster resource in order to promote stock rebuilding. Stock indicators should be updated annually and reported to the American Lobster Management Board for appropriate action. Given the good condition of the GOM/GBK stock, the Panel recommended stock indicators be monitored prior to the next benchmark assessment to detect signs of changing recruitment or other conditions. American lobster is managed under Amendment 3 to the Interstate Fishery Management Plan (FMP) and its Addenda (I - XXIV). The goal of the American lobster management plan is to have a healthy lobster resource and a management regime which provides for continued harvest, maintains opportunities for participation, and provides for cooperative development of conservation measures by all stakeholders. Amendment 3 establishes seven lobster conservation management areas (LCMAs): Inshore and offshore GOM (Area 1), Inshore SNE (Area 2), Offshore Waters (Area 3), Inshore and offshore Northern Mid-Atlantic (Area 4), Inshore and offshore Southern Mid-Atlantic (Area 5), New York and Connecticut State Waters (Area 6) and Outer Cape Cod (Area 7). Lobster Conservation Management Teams (LCMTs), composed of industry representatives, were formed for each management area. The LCMTs are charged with advising the American Lobster Board and recommending changes to the management plan within their areas. The commercial fishery is primarily controlled through minimum/maximum size limits, trap limits, and v-notching of egg-bearing females. Given the critically depleted condition of the SNE stock, the Board approved Addenda XVII - XXII, which implement a suite of measures to reduce exploitation and allow the SNE stock to rebuild. These measures include a v-notching program, trap reductions, closed seasons for certain areas, and a trap consolidation/transferability program. The Board also considered a suite of management measures to achieve a 5% increase in egg production; however, they decided not to pursue this management change at this time given concern that the proposed measures would not significantly improve the stock. The Board continues to discuss future management of the SNE stock in light of environmental changes. In February 2018, the Board approved Addendum XXVI to Amendment 3. The Addendum addresses concerns regarding deficits in existing reporting requirements by expanding the mandatory harvester reporting data elements, improving the spatial resolution of harvester data, establishing a 5-year timeline for implementation of 100% harvester reporting, and prioritizing the development of electronic harvester reporting. In addition, the Addendum improve biological sampling requirements by establishing a baseline of ten sampling trips per year in the American lobster/Jonah crab fishery, and encourages states with more than 10% of coastwide landings in either the lobster or Jonah crab fisheries to conduct additional sampling trips. A prominent issue facing the lobster fishery has been the decline of the endangered Atlantic right whale population. A recent stock assessment showed declines have been occurring since 2010. In addition, NOAA Fisheries declared an unusual mortality event in 2017 after there were 17 confirmed mortalities due to entanglement and vessel strikes. Given the potential entanglement risk posed by lobster gear, the Board initiated Draft Addendum XXVIII to Amendment 3 in February 2019. The Draft Addendum considers reducing the number of vertical lines in the water in response to concerns about the North Atlantic right whale population and the potential impacts of whale conservation measures on the conduct of the lobster fishery. The Board noted reductions will consider ongoing state and federal management actions, including trap reductions and trap caps, which have already reduced vertical lines.